When you add a page to a site, you add and customize web parts, which are the building blocks of your page. This article describes the News web part. You can keep everyone in the loop and engage your audience with important or interesting stories by using the News web part on your page or site. You can quickly create eye-catching posts like announcements, people news, status updates, and more that can include graphics and rich formatting. 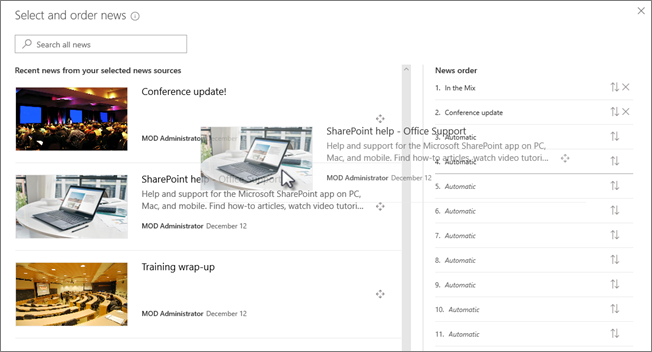 Learn more about how news is used and distributed in the Infographic: Work with SharePoint News on Ways to work with SharePoint. 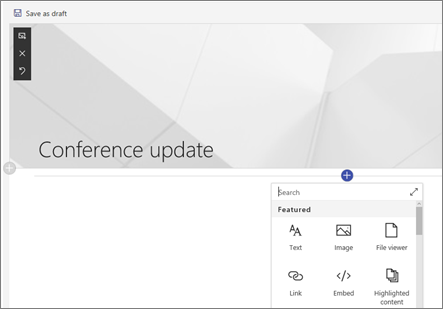 Some of the features described below may not be available in SharePoint Server 2019. 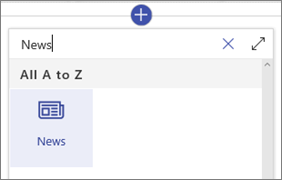 In the web part search box, enter News to quickly find and select the News web part. Click the Edit button on the left of the web part to open the property pane and set options such as news source, layout, organization, and filtering. See below for more information on each of these options. When you are working with a News web part, you can specify the source for your news posts. Your news posts can come from the site you are on while using the web part (This site), a hub site that the current site is part of (All sites in the hub), or one or more individual sites (Select sites). 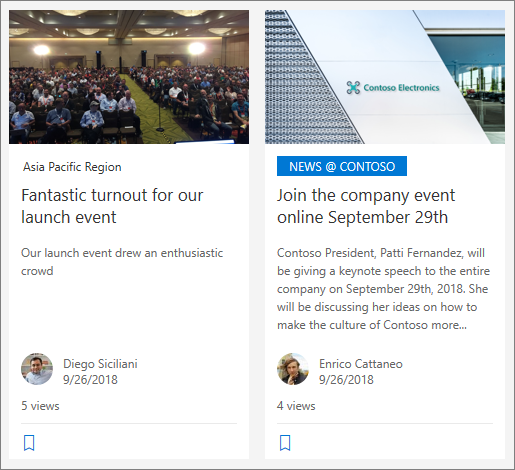 Another option is to choose Recommended for current user, which will display posts from places like sites the current user follows, sites visited frequently, and other news suggested by Office Delve. Click Edit web part on the left side of the News web part. Choose This site, Select sites, or Recommended for current user. 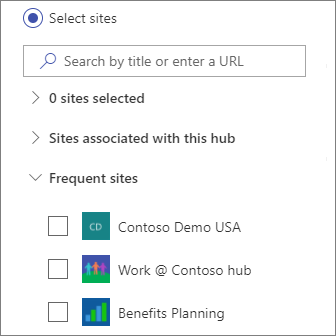 If your site is connected to a hub site, you will see an additional option for All sites in the hub. 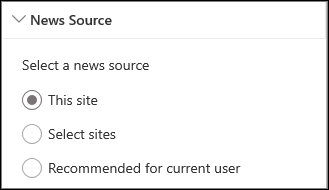 When you click Select sites, you can search for the site you want to add, or select one or more sites from Sites associated with this hub, Frequent sites, or Recent sites. You can choose from different layouts for News. The default layout will depend on whether your site is a team site, a communication site, or part of a hub site. On a team site, the default layout for News is called Top story. It includes a large image space and three additional stories. The List layout shows news posts in a single column. On a communication site the default layout is called Side-by-side, and is a two-column list of stories. 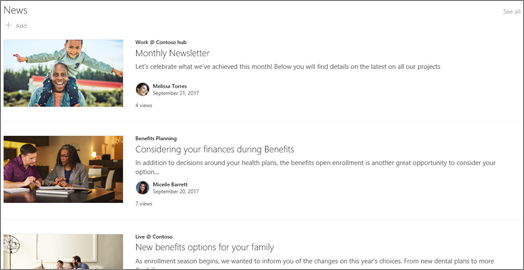 On a hub site, the default layout for News is called Hub news, which includes columns of stories with thumbnails and information, plus a side bar of headlines of additional stories. An additional layout is Carousel, which shows a large visual, and allows users to move through stories using back and next buttons, or pagination icons. You can also choose to automatically cycle through images in the carousel. If you want to hide the title and See all command at the top of the web part, change the toggle to Off under Show title and commands. For List and Carousel layouts, you can use the slider to select Number of news items to show. For the Carousel layout, you can choose to Automatically cycle through news items by sliding the toggle to On. You can show or hide a compact view (a view without images that takes up less space) for the List layout, or show or hide a compact view on other layouts when in narrow widths (like a narrow window or in a mobile view) by sliding the toggle for Show compact view or Show compact view in narrow widths to On or Off. You can put your posts in the order you want them to appear on your page. You can think of this as "pinning" news posts in the position you want. 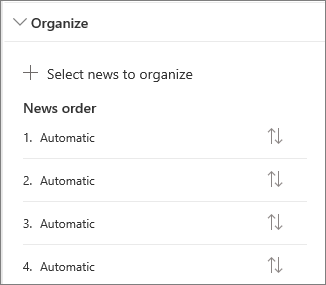 Under Organize, click Select news to organize. In the large pane that displays, drag the recent news stories from the left into the numbered position you want on the right. If you are not seeing the news you want to select, use the search box to find it. Any numbered positions that you do not drag stories into will remain at Automatic, meaning that the news web part will show stories in those positions in order of publish date. 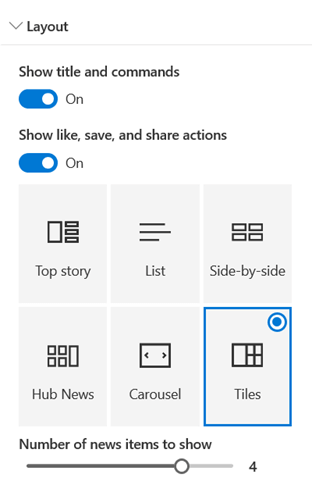 If you want to reorder the stories after you've dragged them into position, select the item and use the keyboard CTRL+up arrow and CTRL+down arrow. When you are done, click the X at the top right to close the pane. 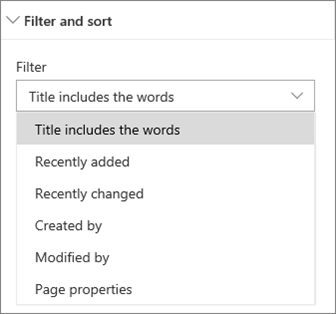 You can filter the posts you want to show by title, recently added or changed, created by or modified by, and page properties. 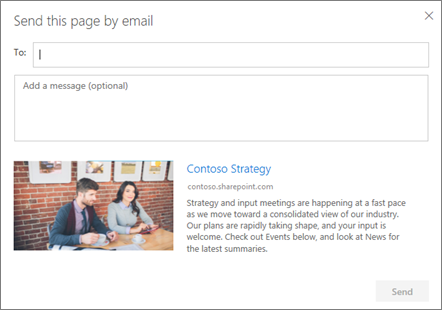 From the SharePoint home page, click +Create news post at the top of the page. Then, choose the site to which you want to publish your news post. On a published page that has a News web part, click + Add in the News web part to start creating your post. Begin with adding a name which will serve as your headline. 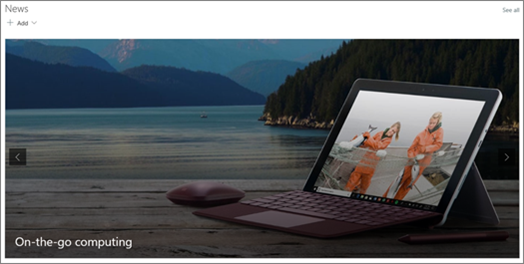 You can use the image toolbar on the left to add or change an image. 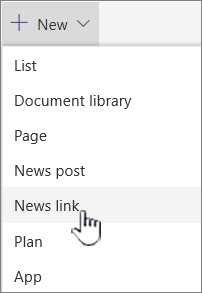 When you are done creating your page, click Publish at the top right, and you'll see the story appear in the News section as the most recent story. Note: The latest stories are shown in chronological order from newest to oldest based on their initial publish date (editing a story will not change its order). Posts cannot be re-ordered. To see a list of all your news posts, See all. You can add a link to content from your site, or from another web site with the News link. The linked content will appear as a news post. Click Post to add the link to your home page. 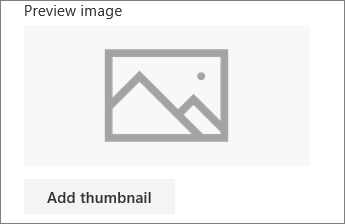 When you use this feature, you can send an email that includes a link, thumbnail preview, description and an optional message to one or more people. Note: The people you share the link with must have the appropriate permissions to be able to see your page. At the top of your news post page, click Send by email. Enter the name(s) of the people you want to send to in the To: box, and add a message if you want. News posts are saved in the Pages library of a site. 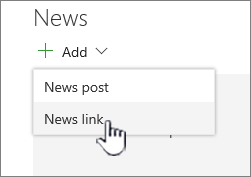 For SharePoint Server 2019 you can delete News pages you've added.